Developed in partnership with the British Geriatrics Society, the aim of this programme is to bring together learning resources that relate to the care of older people into one place. Over time, the resources will grow and be added to, and will become a valuable resource for the wider multi-professional team looking after older people and those living with frailty. The programme provides learning on the acute presentation of illness in older people, anaesthesia, dementia care and multi-professional care presented in the form of e-learning sessions and podcasts. The resources have been collated by Dr Iain Wilkinson, Consultant Geriatrician at Surrey and Sussex Healthcare NHS Trust with the support of the British Geriatrics Society. If you already have an account with e-LfH, then you can enrol on to the Geriatric Medicine programme by logging in to the e-LfH Hub, selecting My Account > Enrolment and selecting the programme. You can then access the programme immediately in the My e-Learning section. 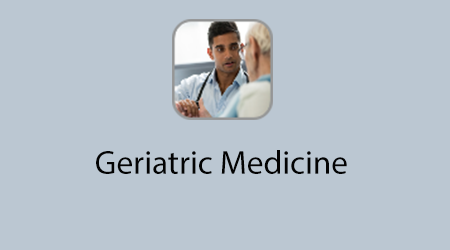 The Geriatric Medicine programme is also available to NHS healthcare staff via the Electronic Staff Record (ESR). Accessing this e-Learning via ESR means that your completions will transfer with you throughout your NHS career.